Visit us at Maker Faire, May 20-22! 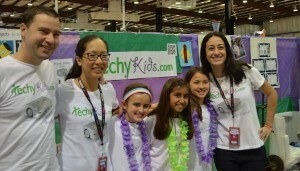 Location Update: The Techykids.com Booth will be in the Make: Activities Tent. See you There! TechyKids.com will be having a booth at Maker Faire (May 20-22nd in San Mateo) again this year, and is looking for volunteers! Students 4th grade and up with Thymio experience can select a spot to volunteer for with parent permission and supervision. Kids of all ages come to the Maker Faire to Explore and Learn. It is an AMAZING EXPERIENCE! Maker Faire is the LARGEST Do-It-Yourself faire! Find out more information here: http://makerfaire.com/ And you can buy tickets from here.